We can cast from ounces up to 2,000 lbs. This means we can handle everything from a single piece up to thousands of pieces. Our foundry consists of two separate sand systems which feed a 14 by 19 Hunter 10H and a 20 by 20 BMM (British Molding Machine). These molding lines are supported by six induction furnaces and three separate Inductotherm power supplies ( 1- 750KW dual trak, and 2 – 500KW dual traks). At Richmond Industries, meeting customer requirements comes first. Upon completion of the tooling, we produce and evaluate samples to guarantee that the customer’s requirements have been met. Once sample approval is obtained from the customer, production is implemented. Richmond Industries, Inc. utilizes a disciplined system of process controls to ensure that production castings meet customer requirements to ensure customer satisfaction. Alloys – C81100, C83450, C83600, C87300, C89833, C91300, C92200, and C95500 are some of the common alloys that are poured, but special alloys can be used upon request. Click here for a list of alloys we pour. 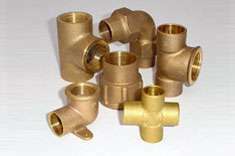 We will quote any brass, bronze or aluminum sand cast alloy, and we can meet any commercial or governmental specifications. All of our offshore made castings are manufactured to the same high quality and precision as our domestic parts. We work with a partner who has unique relationships in a variety of countries. This use of a trusted partner means we can create savings for our clients by coordinating specific commodity or component requirements from several users to achieve savings through buying leverage. Our combined in-depth knowledge, experience and extensive data base means we can provide a single supply-chain system that creates savings and efficiencies for our clients. Our partner is can tailor purchase terms to meet your needs. Letters of Credit, Wire Transfers and Open Account terms can be arranged. We can help you become more competitive in today’s international trade environment by utilizing our global resources to handle all aspects from value analysis, value engineering and inventory management to logistics, procurement, finance and customs control. 1043 days 16 hours 3 minutes 51 seconds.